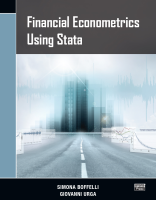 Financial Econometrics Using Stata by Simona Boffelli and Giovanni Urga provides an excellent introduction to time-series analysis and how to do it in Stata for financial economists. Aimed at researchers, graduate students, and industry practitioners, this book introduces readers to widely used methods, shows them how to perform these methods in Stata, and illustrates how to interpret the results. After providing an intuitive introduction to time-series analysis and the ubiquitous autoregressive moving-average (ARMA) model, the authors carefully cover univariate and multivariate models for volatilities. Chapters on risk management and analyzing contagion show how to define, estimate, interpret, and perform inference on essential measures of risk and contagion. The authors illustrate every topic with easily replicable Stata examples and explain how to interpret the results from these examples. The authors have a unique blend of academic and industry training and experience. This training produced a practical and thorough approach to each of the addressed topics. perform intermediate or advanced methods.